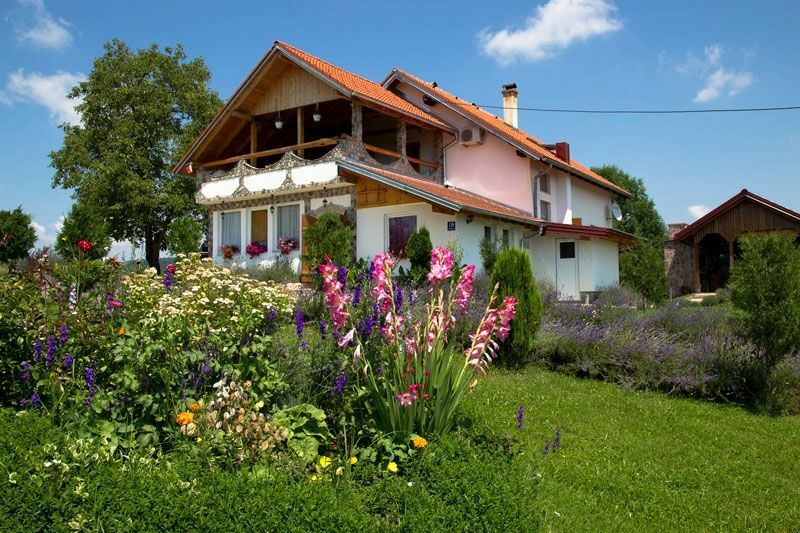 The beautiful house is located in the resort of Rakovica. Here are rented 2 apartments for 7 persons. The apartments have Wi-Fi Internet, private parking, air conditioning, a furnished terrace or balcony, a kitchen or kitchenette and a private bathroom. The house offers its guests a yard / garden use, a barbecue, garden terrace, summer kitchen, lawn and a children&#39;s playground. Breakfast is offered. Bed linen and towels are provided. Pets are allowed. The photos don't do it justice. This is a farmhouse with a lot of land. The hard working owners live on site, and they work hard. There are sheep, chickens, apple trees (we were invited to pick what we wanted), bee hives, and lavender that was newly harvested. Lavender oil and sachets can be bought on site. We were welcomed with a glass of red wine and lots of information from our hostess. The apartment looked fairly new and was in pristine condition. Nicely furnished and a well-stocked kitchen. Only downsides were internet would not work for us (hostess was going to fix router), and there were wasps so we had to be careful about when windows were open. But we would stay again, highly recommend. You need a car here. Beautiful setting, very clean and our hosts were wonderful! We (3 of us) were driving from Slovenia to Lake Plitvice and stayed here only one night. We arrived later in the evening and warmly greeted. We thoroughly enjoyed our place- 2 well appointed bedrooms, kitchen and bathroom, and a nice tv area. We left early the next morning for the park- the only regret we had was wishing we could have spent more time there! It was a pleasure to host you. I hope we will see you again. Dès votre arrivée vous serez surpris par la nature présente tout autour de vous, l'odeur de lavande et l'accueil très chaleureux. Hébergement idéalement situé pour découvrir les lacs de plitvice, passez un séjour au calme en s'éloignant à 10 min de l'axe principal sur lequel les hôtels n'ont pas le même charme. Je vous recommande de prolonger un peu votre séjour pour profiter de la région, et surtout de ne pas manquer de manger sur place, les menus sont copieux et excellents !!! Je recommande vivement la maison d'hôte lavanda.